I’ve been a Liane Moriarty fan since I first read What Alice Forgot back in 2011 (I remember Ella taking a VERY long bath while I sat next to the tub and read the last quarter of the book). I quickly blazed through The Hypnotist’s Love Story (which I thought was lame), The Husband’s Secret (which I had deeply mixed feelings about) and then Big Little Lies (which I thought was fantastic). 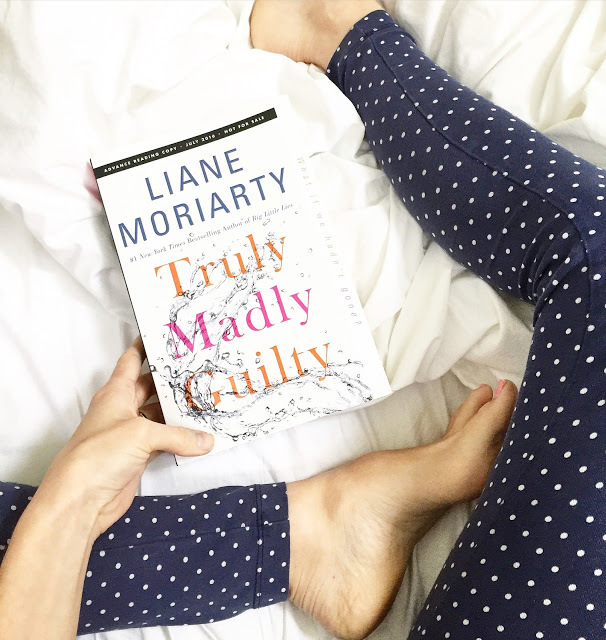 So of course I was ecstatic to see that she had a new book – Truly Madly Guilty – coming out this summer. I read the whole thing in about two days and I’ve been meaning to write about it ever since but . . . I wasn’t quite sure what to say. I liked it well enough (enough to bore Bart with a long detailed synopsis of it when all he probably wanted to do was watch an episode of Person of Interest), but did I like it well enough to recommend it? Always the question. Anyway, it definitely had that Liane Moriarty feeling to it. The story starts out sometime after a summer barbecue. Something terrible happened at the barbecue, but no one will talk about it (and it takes more than half the book to find out what that is). This reminded me a bit of What Alice Forgot, where Alice is trying to figure out the story with her friend, and a LOT of Big Little Lies where you know from the outset that someone has died, but you don’t know who or how or why. There are six major players in the story – three married couples. You have Sam and Clementine. Clementine is a concert cellist and she’s got major audition nerves ALWAYS, but especially right now as she prepares for a seriously big and important audition. She and Sam live a happy, free-spirited kind of life with their two little girls. And Clementine is friends with Erika. They’ve been friends since childhood, but it’s a deeply complicated relationship. Erika and her husband Oliver are a stark contrast to Sam and Clementine – their childless house is completely neat and orderly, both of them having grown up in pretty chaotic and sad homes. They’re supposed to get together with Sam and Clementine on the day of the barbecue, but at the last moment, their larger-than-life neighbors, Tiffany and Vid, invite them and Sam and Clementine over for a barbecue, and they all accept. So it’s the six of them, the two little girls, plus Tiffany and Vid’s tween daughter, and something terrible. The plot switches back and forth between the present (some six or eight weeks after the barbecue) and the day of the barbecue, and as you start to uncover what happened at the barbecue, you also learn a lot more about each of the characters and their backstories, which, in typical Moriarty fashion, are full and rich and just a little more interesting than your regular person, probably. I generally steer away from reading reviews of a book before I write about it (kind of like how when you see a movie version of a book, you can’t remember how you imagined the characters or setting yourself) but in this case, I was pretty curious about what Amazon had to say about it. I didn’t read many reviews, but for comparison, her four most recent books have right around 4.5 star averages. Truly Madly Guilty is sitting at a 3.6. So, apparently lots of people aren’t sure what to make of this story. All of which is to say, it’s a fairly engaging story, but I’m not sure that I loved it, and I’m definitely not putting it in my list of favorites any time soon. Have you read it? I’d love to hear what you thought about it. I was so interested to hear your thoughts on this one because I know you are a big fan of hers – I am only part way through the book and I have to admit I am not loving it as much as What Alice Forgot or Big Little Lies, which were both favourites of mine. It's definitely lacking a bit of the excitement or build-up. I feel like a lot of the big books I was most waiting for this summer have been a bit of a let down, none of them have been absolutely amazing, which I realize is a pretty high standard to hold them to! This is still up next for me, after I finish my current reads! I haven't read it, but I plan to! I enjoyed Big Little Lies. Truly Madely Guilty is definitely being added to my reading list! I'm surprised you haven't read Three Wishes and The Last Anniversary. I can't remember the details of those books, but I gave them 4 and 3 stars respectively. Big Little Lies, What Alice Forgot, and The Husband's Secret were all 5 stars for me. I also didn't enjoy The Hypnotist's Love Story and only gave it 2 stars. Ha I just finished reading this last night! I had very similar thoughts. It was definitely an enjoyable burn didn't love this as much as some of her others. I think if she had shaved 50-100 pages I would have it liked it more. Oof, I was so annoyed how the "big mystery" was dragged out. I almost put the book down several times because of how each chapter ended with, "oh but the day of the bbq…" I really like What Alice Forgot, Big Little Lies and The Husband's Secret. I actually burned through all three of those in two weeks time. This book took me almost 3 weeks just on its own because I was so annoyed by it. I agree with you about the depth of the characters. At the big reveal and everything that followed I just kept thinking, so what? I wouldn't recommend this book, I was disappointed by it.